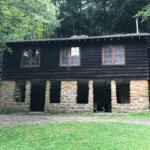 Facility Details in Hocking Hills | Camp Wyandot, Inc. Looking for a rustic camping experience? 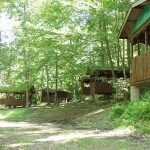 Spend your weekend in scenic Hocking Hills, Ohio, in our Specialty Lodging or lakeside Cabin Row cabins (seasonal). Spruce up your conference by holding it in our Dining Hall! See amenities below and contact us (info@campwyandot.org) for pricing details! Rentals require a reservation at least two weeks in advance with all paperwork and payment completed one week prior to arrival. You may also purchase exclusive use of our camp to hold a private event. Discounted rates are available between November-March when the water is turned off. 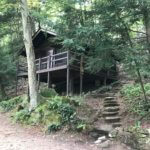 Contact us (info@campwyandot.org) to rent a cabin for your Hocking Hills adventure! Includes electricity, fireplace, and pot belly stove. Separate sleeping in lofts. Includes refrigerator and microwave. Renting the Dining Hall is possible. Additionally, you can schedule to have meals (breakfast, snack, lunch, or dinner) prepared for your group by our staff. Check-in for your rental is between 1 PM and 4 PM. Check-out is before 12 noon or else you will be charged a Day Use fee. 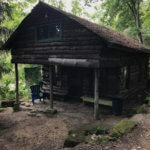 Your rental will require you to sign and return a copy of our Rental Agreement for use of Camp Wyandot.